Towson University officials confirmed Friday that there is an ongoing investigation into an incident in an on-campus garage that was posted about on Twitter. 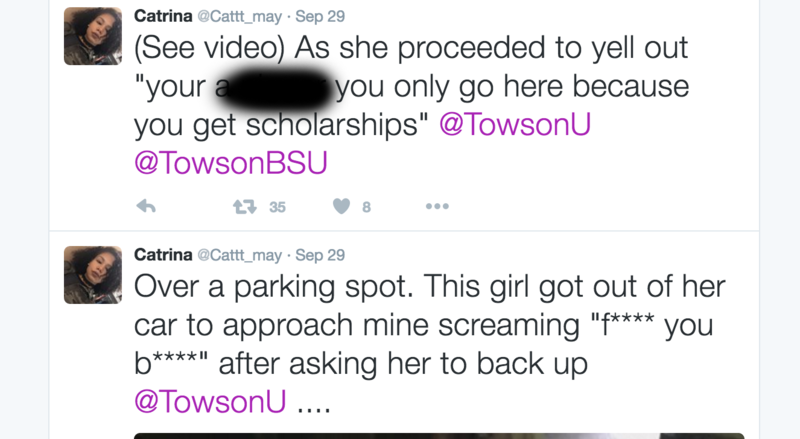 A Towson student under the Twitter handle @Cattt_may, who The Towerlight has identified as Catrina Williams, said another student called her a racial slur and yelled other obscenities at her over a parking spot. According to Williams’ Twitter, the other student, “got out of her car to approach mine screaming” obscenities after Williams had asked her to back up. Williams tagged Towson University in the tweet and someone monitoring the account responded, saying Williams could report the incident if she felt it was warranted. “We are concerned about what was posted on social media and we want to determine the facts as quickly as possible,” Towson University Senior Director of Communications Ray Feldmann said in an email. Williams did not respond to a request for comment. The Towerlight reached out to the student who was accused of using a racial slur on Twitter after she was identified by other users of the site. The woman said she did not want to be named or to have any information about her discussed. According to Williams, the woman who used the slur approached Williams’ vehicle “acting innocent on camera” after the incident. President of the Black Student Union, Sey Elemo (also a former Towerlight contributor), said that the BSU reported the videos of the incident on Twitter to Associate Vice President of Campus Life Teri Hall and Assistant Vice President for Student Affairs & Diversity Santiago Solis and will follow up to make sure that there is an investigation. The TU chapter of the NAACP also reached out to Williams on Twitter to offer help. Another screenshot from the student’s Twitter. Feldmann said that it is not necessarily a prerequisite for a report to be filed before the University starts an investigation into hate/bias incidents, but that every situation is different. Students can report hate/bias incidents online here.